To give a clear understanding of the market, the report comprises a market taxonomy that bifurcates the market into different segments based on several parameters. Broccoli is famous for its functional use due to high content of nutrients. The manufacturing of broccoli extract takes place with the help of two parts of the broccoli plant, i.e. sprout and seed. The sprout extract is said to contain higher amount of glucosinolates and is considered as the purified powder form of broccoli sprouts. Whereas, broccoli seeds yield a better quality and purified form of glucosinolates. 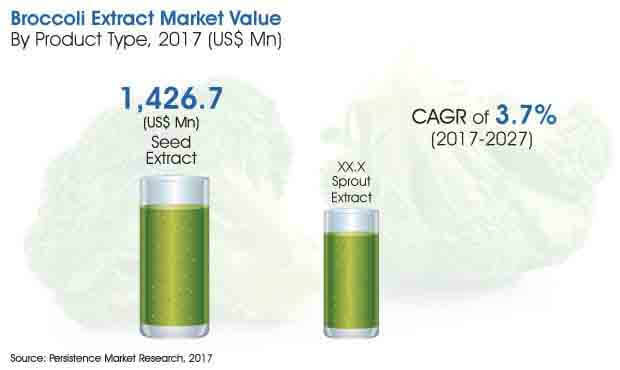 According to the forecast presented in the report, the seed extract market is expected to lead the product type category with a projected market size reaching over US$ 2,000 Mn by the end of 2027. However, the sprout extract market is expected to expand at a higher growth rate of 4% during the forecast period. Owing to the rising awareness among people regarding the health benefits of broccoli, the global broccoli extract market is expected to experience significant growth given the increase in consumption of broccoli extract. Manufacturers of broccoli extract are focusing on introducing organic, clean label ingredients, due to increase in the demand for transparency in the quality of products. Additionally, consumers are seeking broccoli extract that is healthy, convenient to consume, organic, and provides quick results. Top companies in the broccoli extract market are focusing on research and development activities in order to develop novel products to treat various health conditions such as diabetes, cancer, high cholesterol, etc., which are rampant among the global population. Manufacturers are also strengthening their capabilities with broader offerings to meet the growing market demand for organic products. Broccoli is known to be a tasty vegetable that is rich in nutrients. A phytochemical derived from broccoli sprouts – called sulforaphane – helps in preventing cancer by detoxifying compounds taken into the body and by enhancing the anti-oxidation ability. Sulforaphane is also known to improve symptoms of autism in some people. A study has also revealed that broccoli can optimize the blood-sugar level in patients with Type 2 diabetes. This makes the application of broccoli extract in the healthcare industry an important revenue growth driver for the global market. Also, there is a visible increase in the use of broccoli in the production of personal care and cosmetics in regions like Latin America. Sulforaphane present in broccoli extract aids in skin repair and helps in slowing down ageing. The vitamin C in this wonder veggie eliminates free radicals, making hair thick and healthy. This appeals the most to the younger segment of the population who seek to invest in personal grooming to look beautiful and to maintain their health. E-commerce has become a convenient and accessible channel for the sale of products. This is helped by the increase in adoption of smartphones and high speed internet facilities. E-commerce has also impacted the global broccoli extract market with manufacturers and retailers setting up online distribution channels on their websites and other popular e-commerce chains for selling broccoli products. People prefer purchasing such products online due to the discounts and other freebies offered by e-retailers. For instance, iherb.com, vitacost.com, grofers.com, Amazon, etc. are some of the online stores that supply broccoli extract products to consumers all over the world.